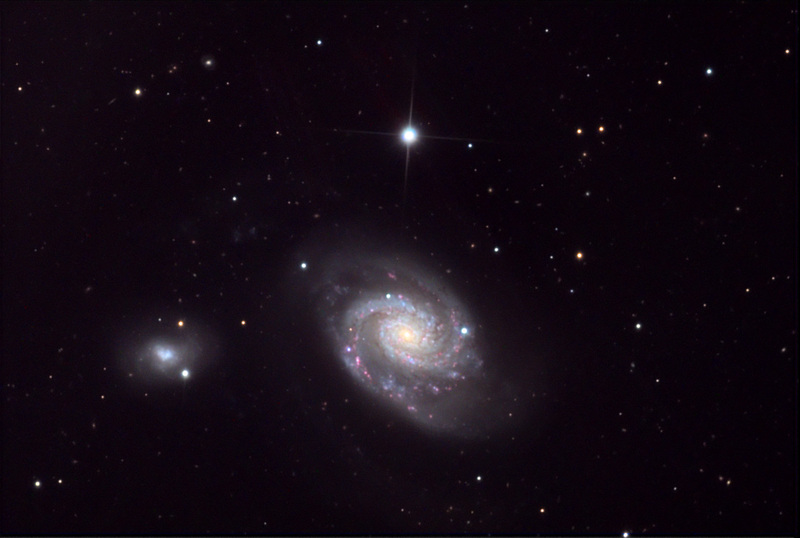 Title: An interaction scenario of the galaxy pair NGC 3893/96 (KPG 302). A single passage? The interaction between two galaxies could arguably be hailed as the best show in the Universe. The gravitational and tidal consequences of a close pass of two galaxies (one that could even lead to a full on merger) can be catastrophic; destroying morphological features and streaming huge chunks of a galaxy’s innards into outer space. The problem is, that the show takes too long. If we could watch a speeded up version, we could see the two galaxies dance together in a spectacular show down, but we only ever get to see a snapshot, frozen in cosmic time. One particular snapshot of interest is the interacting pair NGC 3893/3896, shown in Figure 1. The pair consist of a grand design spiral galaxy (3893) and a companion (or satellite, such as the Magellanic Clouds around the Milky Way) dwarf galaxy (3896) located in the Ursa Major cluster of galaxies which have, up until now remained relatively isolated. The impact of their interaction cannot be easily deduced in Figure 1, however the authors of this paper show that in an enhanced R band image from DSS2 (Digitized Sky Survey) the tidal features become enhanced; see figure 2, suggesting a previous close pass of these two galaxies. 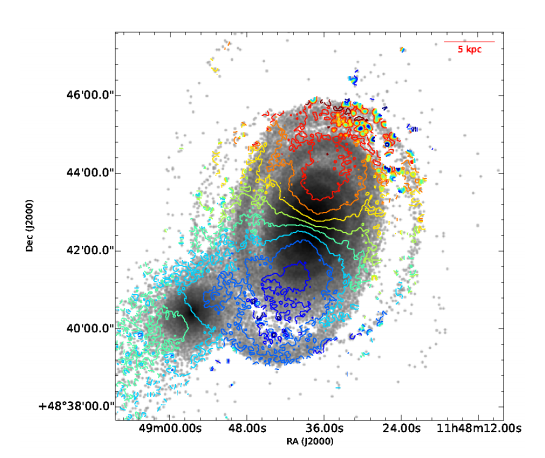 The authors in this paper want to model this interaction with the aim of reproducing the observed snapshot which we see today, including: the orbital arrangement, the origin of the dwarf and the spiral pattern in the large galaxy. However, this process, despite increased computing power, is incredibly difficult because of the huge number of possibilities for the initial conditions for the two galaxies, which leads to multiple possible solutions. The authors try to tackle this by imposing tight constraints on their models from observations, e.g. the dwarf to spiral stellar mass ratio, and by making simplifying assumptions, e.g. that the pair are isolated in space. The authors model the interaction using a Smoothed Particle Hydrodynamics method with , and particles from the stellar disk, gas disk and bulge respectively. The dwarf is then a scaled down model of the larger spiral galaxy with particles total and many different combinations of orbital parameters were tested in order to find the best solution to match observations. This best solution from their simulation can be found in this video, however Figure 3 shows a snapshot of it, similar to how we would observe the interaction. The authors were able to reproduce both the projected separation and velocity dispersion differences between the two galaxies, as well as some of the faint features seen in Figure 2. However, there are clear differences between the observations and the model. These include the prediction of another faint spiral arm tail, spiral arms which are wound more tightly than observed and a mismatch of the kinematic axis of the satellite. 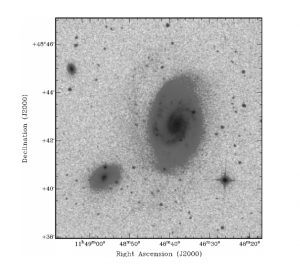 The authors suggest that these discrepancies may be ironed out if in fact the interaction between these galaxies has included not one, but two close passes in the past. However, as seen in the video, the dwarf galaxy in their simulations never makes it to two close passes before it mergers completely with the larger spiral. Perhaps the downfall of the model is due to the simplifying assumptions that were made initially. The pair are, in fact, not isolated in space but part of a much larger galaxy cluster and therefore may also be interacting with their neighbours, e.g. 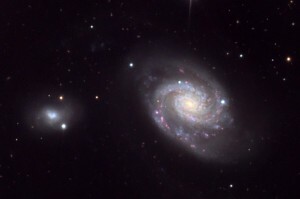 NGC 3906 or 3928. Interactions on such a large scale as this make it difficult for astronomers to understand how interactions, mergers and cluster dynamics work together from the birth of the very first galaxies, through the build up of mass and morphological changes, to produce what we see today. 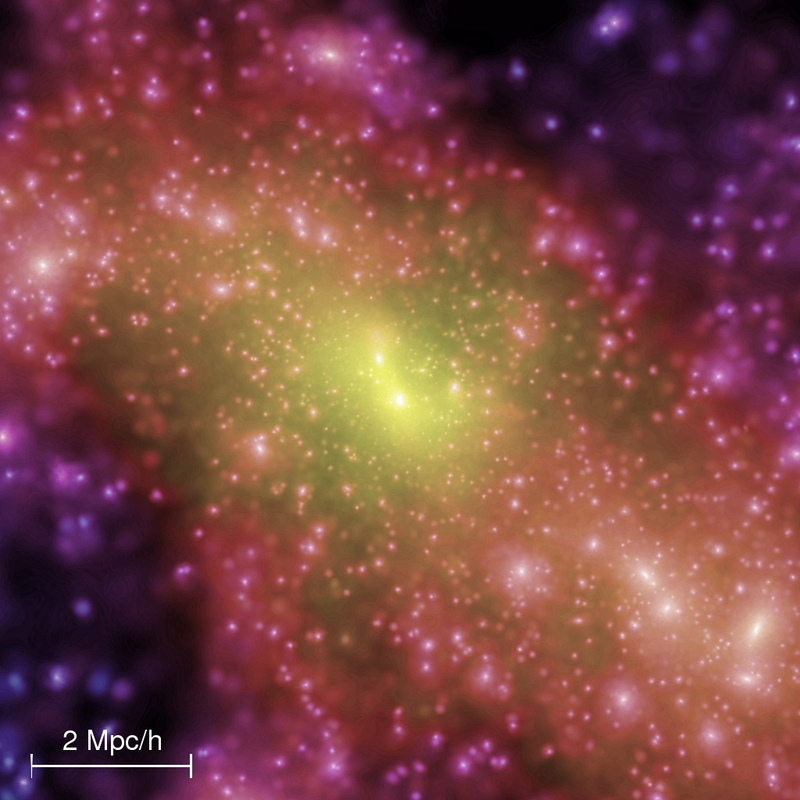 Simulations, such as the one in this paper, provide a wealth of information about the dynamics of these interactions and their corresponding piece in the puzzle of galaxy evolution.